The society has a very enthusiastic team who largely consider outreach activities to be an extension of their hobby. We do it because we enjoy it! You will find us friendly, knowledgeable and full of passion for astronomy, space and the night sky. 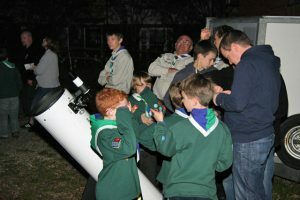 We are very active in the local community and, in addition to our regular public stargazing nights, we run stargazer workshops and events for schools and Scout/Cub/Brownie groups. If you are part of a group which would like to learn more about the night sky, we are more than happy to get involved. 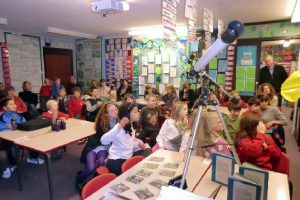 Our school events can be tied to KS2 and KS3 on the National Curriculum, and we can also give assistance to Cub, Scout or Brownie groups wishing to achieve the Astronomy, Science or Stargazer badges. We bring along a range of telescopes for everyone to look through and, depending on the weather conditions and what’s up the night sky at the moment, were are able to provide stunning views of the Moon, any visible planets and even some deep sky objects such as nebulae, star clusters and galaxies. On lighter spring or autumn evenings we may also bring along specialist solar telescopes for observing the Sun in complete safety while we wait for the skies to darken enough to view the stars. 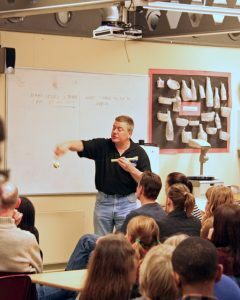 We can teach you about the constellations in the night sky and how to recognise them, as well as answering any questions you may have about the solar system and beyond. If the weather is poor, we can offer an indoor astronomy & space presentation and we’ll also put some of the telescopes out for display. We have a scale model of the solar system, which never ceases to amaze, and our friendly astronomers will willingly take questions on all aspects of astronomy. It’s obviously not the same as looking through the telescopes, but will at least give a brief introduction to astronomy. While there is no specific charge for our visits, we do welcome and appreciate donations to the Society for our time, which help to cover the travelling costs of our volunteers. A minimum of £1 per person/child is suggested. As much as we would love to do this as our day job, unfortunately many of our volunteers do have to work. For this reason, we would prefer midweek events to begin around 7pm or later, as this gives us the best chance of ensuring we have enough volunteers to cover your event. We welcome requests from the vicinity of the Braintree-Witham-Chelmsford-Colchester area, as that is the main catchment area for our volunteers. Requests from further afield will need further consultation before making a commitment to you. Wherever you’re based, contact us first and we will see what we can do. What if the sky is not clear? Astronomy is very weather dependent and we all know that in the UK clear skies are by no means guaranteed. If the weather is cloudy, or worse, we can offer a back-up indoor presentation. We cannot usually postpone visits for another time simply because our calendar is often fully booked. When you contact us, we will talk to you about which options are open to you, as it may be dependent upon your location and the availability of particular volunteers. Are you available all year? We are very busy with requests over the autumn, winter and early spring months, especially during school term time. The evenings between May and September are really too light to do any useful observing and so we generally take a break from outreach over the summer. If you would like to do some solar observing, we would recommend you come to one of our solar observing days at Great Notley Discovery Centre in May, June, July and August. How long will an event last? We usually aim for a couple of hours. If it is a clear night, and interest is there, we can go on for longer. Equally, if it’s cloudy and we have to resort to back-up activities, the event will be curtailed and may last perhaps 60–90 minutes. We would suggest that groups are kept to below 80 people, so everyone gets a good chance to look through a telescope. Whilst many of the members of the society have DBS checks relating to their employment, The North Essex Astronomical Society will not require members to have a DBS check to conduct outreach. All organisations are informed of the fact that our members do not have DBS checks and there is an expectation that the organisation supply members of staff/volunteers with DBS checks and conduct a risk assessment for the involvement of the NEAS. NEAS members will refuse to be in a situation where they are left alone with children/vulnerable adults or in a circumstance where they would be expected to be without support from the outreach organisation. All Society members involved with our outreach activities have agreed to and signed our own Child & Vulnerable Adult Protection Guidelines. If you are excited by the idea of the universe being brought to your doorstep then please contact us to arrange an exciting and interactive session. Please include your location, age range, group numbers, and any preferred dates. Our outreach officer will get back to you to organise it.